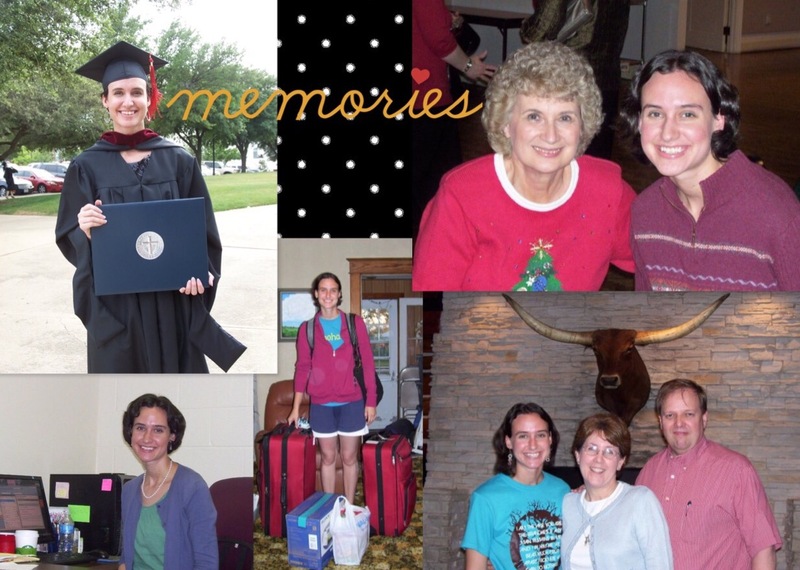 Eight years ago this week, I packed up my few precious earthly belongings and headed out for a grand adventure. I was driving down a road of unknowns, to live with someone I had never met in person, to become an admin for someone I had only talked to through email. I almost turned around when I got to the multi-layer overpasses that greet Dallas visitors, for this Nebraska farm girl was in new territory. But, a 9-month internship turned into some of the best 5 years of my life. It wasn’t where I ever thought I would end up. My internship was supposed to be in Cambodia, it was supposed to get this overseas bug I had caught the summer after sophomore year out of my system. Instead, I learned some incredible lessons, built relationships with some amazing people, earned my Master’s degree, and finally figured out God just wanted my ‘yes’, no strings attached. The woman I met for the first time as I carried my suitcases into her home became one of the strongest influences in my life as she opened up her heart to me and showed me the most amazing generosity. I sat at her table for 5 years of Saturday morning breakfasts as we debriefed the week over re-filled-often cups of coffee. We curled up under blankets to watch Hallmark movies, she welcomed me into her extended family, and she patiently listened to all of my dreams and goals, frustrations and sorrows. She daily lived out a faith that I can only hope to see in my own life. The bosses that I hardly knew are now my role models and cheerleaders. I can’t even begin to count the lessons that I learned from them that are now a part of my life; beginning with the meaning of Unreached peoples, how to balance work and rest, how to pray, joy against all odds, how to do what it takes to get the task done. I was by no means a perfect admin, and there’s a lot I would change if I could go back and do it all over again. But I am so very grateful for the five years that I got to watch these heroes of mine up close. I found a church family that welcomed me in with open arms. I probably have more grandparents who spoil me there, more friends who give me hugs when I come home, more people there who battle before the throne of the Heavenly Father on my behalf, than I ever could have imagined possible. I got to fulfill one of my dreams to attend graduate school. Homework was hard, writing papers was hard, balancing school and work and trying to have a life was hard. But I met students from all over the world. I got to learn from professors who have been where I am now and I grew from their stories of triumphs and mistakes. And if it weren’t for a practicum that took me around the world, maybe I wouldn’t be in the place I now call home. Texas, you have a big heart. Thank you for being my home for 5 years, for being a place I love to go back to. Thank you for the beautiful people who live within your borders. Happy Anniversary.